In the latest Investa Inside Q2 Office Market Outlook released yesterday, Investa focuses on three themes: the uptick in commercial office construction, Australia’s top performing leasing markets and capital market performance in the context of recent financial market volatility. 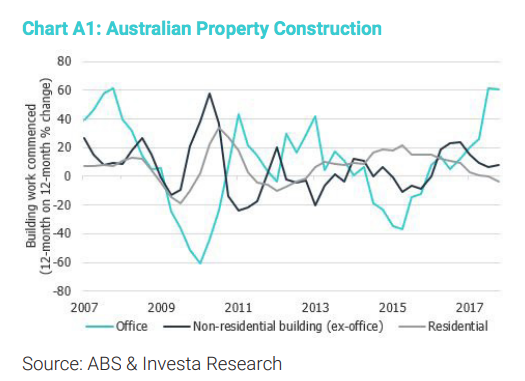 According to Investa, following the lull in commercial property construction in recent years, strong leasing market fundamentals in Sydney and Melbourne’s office markets have driven a solid rebound in office development. A surge in new office projects is filling the void left by the slowdown in residential property construction, with annual office commencements 60% (or $3.16 billion) higher in 2017. This growth is creating supply-chain bottleneck issues and driving the cost of building materials and development higher. Investa Office Fund’s (IOF) Barrack Place, at 151 Clarence Street will be the only significant office project to be delivered to Sydney’s CBD in 2018 with a total of 20,400 sqm leading off Sydney’s CBD office supply cycle. However, withdrawal activity in Sydney’s CBD is expected to continue to provide a supply headwind and drive negative net supply in the second half of 2018 and through 2019. 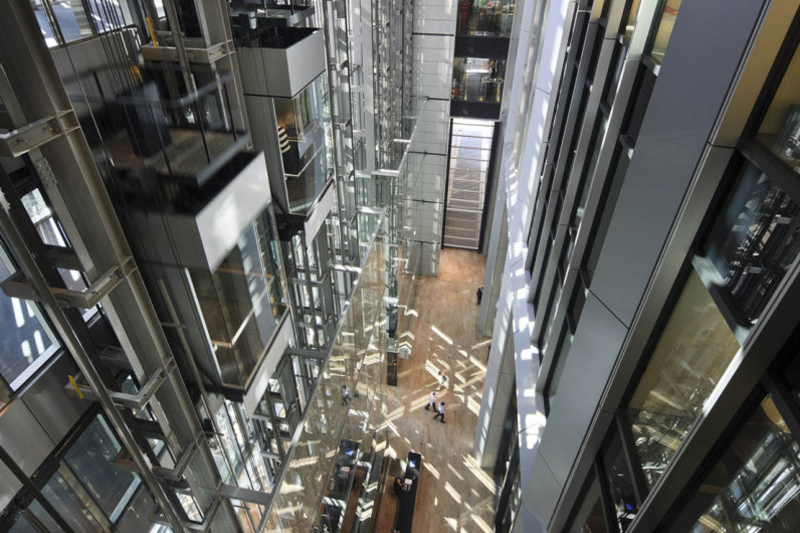 The only major new office project countering the negative tide of withdrawals in 2019 will be Investa Commercial Property Fund’s (ICPF) 60 Martin Place, adding 40,300 sqm to Sydney’s CBD office market in H2 2019. Following on from these projects, the belly of the supply cycle will provide a further 210,000 sqm across projects including Wynyard Place (~68,000 sqm, H2 2021), Quay Quarter (~90,000 sqm, H2 2021) and Circular Quay Tower (~55,000 sqm, H2 2021). The report also highlighted that Australian CBD office conditions continue to reflect two-speed markets. 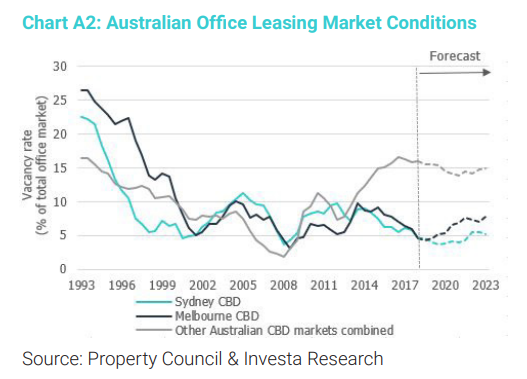 Office leasing markets in Sydney and Melbourne are the clear outperformers with vacancy rates driving below 5%, towards new decade-lows. While leasing conditions across the other Australian CBD markets remain soft, recent indicators point to an improved outlook in the coming years. Looking ahead, Investa expects the relative outperformance of Sydney and Melbourne’s CBD office markets, or the wedge in office market conditions, will ease in the coming years. Investa notes that Australian office capital markets have remained steady in the face of both increasing bond market yields and the recent spike in financial market volatility. Investor demand and capital flows will continue to be attracted to Australian CBD office markets for some time yet. 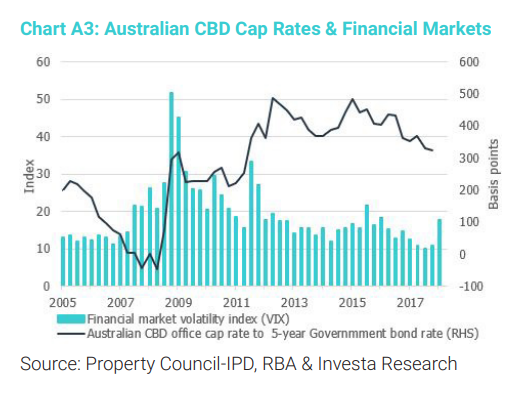 Despite office market cap rates compressing a further 40 basis points across Australian CBD markets in 2017, strong total returns and favourable underlying market conditions are likely to maintain downward pressure on Australian CBD office cap rates in the coming year. Investa also noted that Australia’s 27th consecutive year of economic growth looks set to continue for some time yet, supported by a positive outlook for the business economy and the office-based services sector. 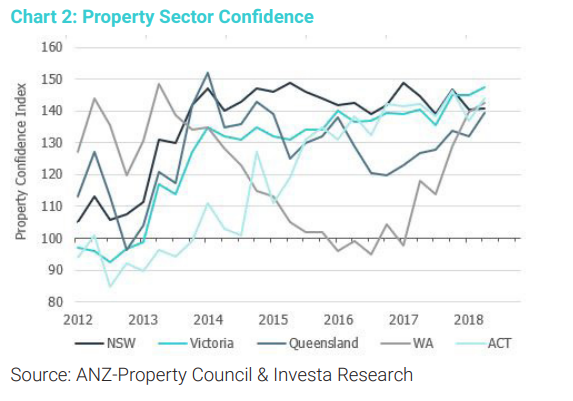 Business conditions for the finance, business services and property sectors are the strongest they’ve been in over a decade and profit growth across white-collar businesses remains strong.